Only NeighborhoodScout Real Estate data uncover specific housing market details for every neighborhood in America, so you can effectively vet various locations and compare them against state and national averages. Perhaps you’re looking for an investment property. Do small 2, 3, and 4 unit apartment buildings make up a substantial portion of your desired neighborhood’s real estate stock? What does this neighborhood yield in terms of market rate rental income? How do those rent values compare to other neighborhoods in the city, or to other cities in the state? Maybe you want to convert a single family into condominiums. Does the neighborhood have low single family housing stock? Are there many predominantly old and large (5 or more bedroom) residences which may require additional capital expenditures? Only NeighborhoodScout® provides home values, rent values, rent by bedroom, housing stock, and more at the hyper-local level, enabling you to plan and invest wisely. Average Home Value and Median Home Value are the two common metrics real estate professionals use to determine housing value. However, it is important to note that with Average Home Value, data can be skewed by one or two homes that sell for a lot more or a lot less than the others in a given area. As a result, Median Home Value is more stable, showing what houses in a city or a neighborhood are really going for. Make comparisons that matter to your bottom line. Understand precisely how your neighborhood’s home values stack up against other locations. Are home prices in your neighborhood among the highest in the state? What are the real estate taxes in your area, compared to surrounding neighborhoods where you could make a similar investment? NeighborhoodScout’s Median Home Values combine data from the United States Bureau of the Census with quarterly house resale data provided to the FHFA by Fannie Mae and Freddie Mac. 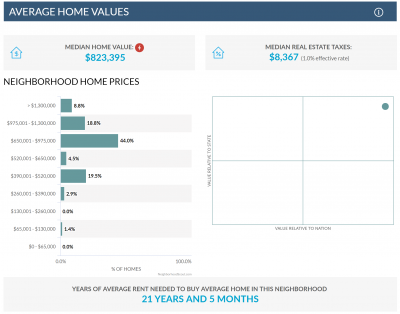 The data reflect home values for the neighborhood overall, not necessarily each individual house in the neighborhood. We also show how each neighborhood’s Median Home Value compares to other neighborhoods in the nation, and within the same state. Exclusively developed by NeighborhoodScout, Average Market Rent reveals the average monthly rent paid for market rate apartments and rental homes in the neighborhood (excluding public housing). Determine what the market will bear. Perhaps you’re looking for an investment property. What does this neighborhood yield in terms of market rate rental income? How does that number look like compared to the rest of the state? 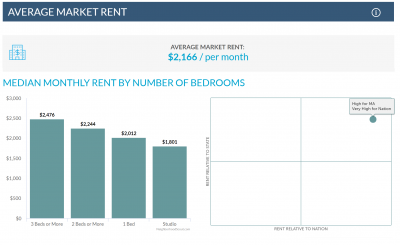 NeighborhoodScout removes the effect of public housing and subsidized housing, which provides an average rental price that is reflective of only market rate rental units. This makes a big difference in areas where public housing with very low rents exists next to market rate housing with much higher rent. At this time, NeighborhoodScout does not have information readily available for appreciation rates for buyers who purchase properties with multiple units, and we do not have data reflective of the appreciation trends concerning average market rent over time. As a result, it makes sense to research appreciation trends on homes with multiple units in the areas where you’re considering investing, as the average market rent is not indicative of past or future appreciation. NeighborhoodScout provides rich detail about the way a neighborhood looks and feels when you walk or drive around it. From high rises on the coast, to rural farmlands, neighborhood’s setting contributes greatly to its level of appeal with home buyers and renters, making all the difference in your investment outcome. Make a match. Would your targeted investment property appeal to urban professionals or families with small children? It your neighborhood close to the ocean, lakes, and other outdoor attractions? Understanding what your neighborhood brings to the table can help you attract the best tenants and top dollar. 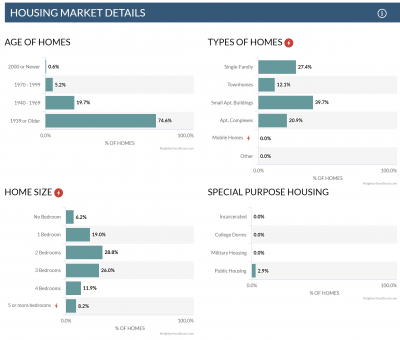 NeighborhoodScout’s Housing Market Details provide a snapshot of the age, type, and size of homes in your desired neighborhood, so you can determine if it is the right fit for your investment goals. Know what’s on the market. Are there a large amount of older homes in this neighborhood which might require additional capital to bring up to code? Are there small, single family homes that you can easily renovate and rent, or does the neighborhood have a high percentage of four and five bedroom residences that would take time to convert – but also provide strong rental income? Housing market details help align a neighborhood with your investment goals. NeighborhoodScout Homeownership rates help investors and homebuyers determine the percentage of housing units in the neighborhood that are occupied by the property owner versus occupied by a tenant. Does the market support your goals? Whether you’re looking for a single-family home to own or an investment property to rent or sell, understanding the availability of housing stock in your desired neighborhoods is crucial to success. The only real estate market and housing stock data available at the neighborhood (sub Zip Code) and micro-neighborhood (nearly 10x smaller than a Zip Code) level. NeighborhoodScout uses over 600 characteristics to build a neighborhood profile for each and every neighborhood (census tract) in America, including the rental areas versus owner occupied, age, size and style of homes, the density of buildings, numbers of farms, coastal setting, and many more. This set of characteristics captures the true look, feel, and character of places like never before. The data NeighborhoodScout is the latest neighborhood statistics available from several leading government sources, including the U.S. Bureau of the Census, the U.S. Department of Justice, the National Center for Education Statistics, and the U.S. Geological Service, among others. We bring information from these different agencies together in one giant database and then we use our PhD-level expertise to create new, useful profiles and insights about neighborhoods, cities, and towns all across America. Sign up for data alerts. Get notified when scout's data gets updated.